Help the locals clear out the undead and take back their homes. 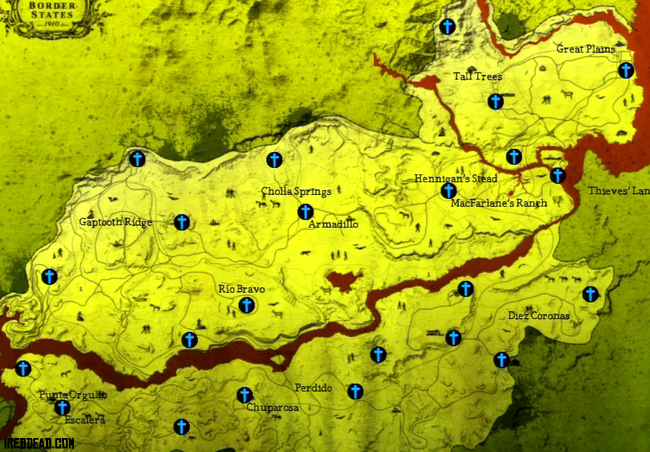 There are 20 towns to save in Undead Nightmare. Fort Mercer, El Presidio, and Casa Madrugada are Safe Zones. Each town has its own difficulty and rewards including weapons among other items found in chests. After saving a town it will occasionally become overrun again so look out for the warning messages and check your map once in a while. The survivors cannot hold off the zombies forever and when they all die the town is lost. You can still save it after that but the safe status will only be temporary and there will be no chests to gain ammo or other items from. Each town presents its own advantages and disadvantages. Most have plenty of high elevations (such as buildings) to get above the undead hordes. Many also have open areas to take out multiple zombies at a time with dynamite or other large area weapons including bait to allow for easy shots at the undead. Try to keep away from the survivors when possible. The zombies usually spawn near you so this will help prevent survivors from dying either from the zombies or your own friendly fire. A great example is Blackwater. Hang out in the more vacant south end of town. It's open and far away from the survivors. Having an Apocalypse Horse such as War and especially Death can make saving towns much easier by simply riding through the zombie hordes to damage or kill them.